The thinking styles that obstruct change and recovery after a traumatic event are of course ones that were learned earlier in a person’s life. The simplest way to deal with them is to show the person how they are operating and have them practice an alternative. It’s not very glamorous compared to ten years of psychotherapy, but it’s a lot cheaper. Andy Austin lists several of these “patterns of chronicity” and here we have adapted his categories as a reminder. The Big “Why…?” Question. “Why did this happen to me?” The positive intention of past-related “Why?” questions is to find new meanings, but the person rejects each possible future-oriented meaning and keeps searching as if trying to find a meaning which can change the traumatic event or recreate the past. The Big Maybe Response. When asked to scale their current experience of an emotion, or give any report on their internal experience, the person says they are not sure, or prefaces their answer with “Maybe”. The positive intention of “Maybe” responses is to avoid mistakes such as false hope, but by refusing to commit to any specific data, the person can never measure change and can never experience success. Testing for Existence of The Problem Rather Than Testing for Change. Even though 99% improvement might be made, if the person with chronicity is able to locate just 1% of the problem existing, this will generally be seen as representative of 100% of the problem existing. The positive intention of “Can I still do it?” responses is to detect and respond to danger effectively, but by failing to notice improvement the person continuously reinstalls the entire problem. Negative Nominalisations. The person talks about their traumatic responses as if they were “things” rather than actions. “I have Trauma”, “I have PTSD”, “I have a Wounded Inner Child”, “I have a Clinical Depression.”. The positive intention of Negative Nominalisations is to explain what is happening by labelling it, but the result is that the processes being discussed seem permanent, damaged and even become personified as malevolent, and so are unable to be simply changed. Being “At Effect” rather than “Being At Cause”. By being “at effect” the person experiences emotional problems happening to them, rather than being something that happens by them. A person “at effect” will seek treatment rather than seek change. Questions such as “Will this work for me?” or statements such as “It didn’t work for me.” And “It worked for a day and then the problem came back.” Presuppose that the problem and the NLP process are 100% responsible and the person themselves is 0% responsible for their own results. The positive intention of “At Effect” responses is to explain what is happening without being at fault, but by not allowing for the possibility of their responses affecting their internal experience, the person makes it impossible to change their experience. Three Stage Abreaction Process. The person has a “nocebo” (I will not please; the opposite of placebo) response to NLP processes where they have an “uncontrollable” negative response to all interventions designed to actually help them change, although they permit interventions which maintain their problem. A small percentage of all medical clients in clinical research trials will complain that they get headaches etc due to an inert “pill”. This nocebo response also occurs with psychological interventions. “Abreaction” is a term from Freud’s work, referring to the re-anchoring of an old traumatic response. The positive intention of “Abreaction” responses may be to protect the person from feared results of the change process, but it blocks all change. It is of course perfectly possible to explain that abreaction-nocebo responses are simply accidental anchored responses and of little psychological significance (a view closer to Carl Jung’s view of them). Stage 3. Abreaction (what Andy Austin calls Punishment of the Practitioner) e.g. vomiting, convulsing, running out of the room screaming, uncontrollable crying. Just pointing out these patterns and encouraging clients to create more useful foci for their attention is the solution to these patterns. The search for a special magic that will make the patterns go away is part of the problem. Like any new behavior, developing more resilient patterns of responding to challenges takes time and attention. The Key Questions process is useful for helping a person consciously create a new more effective guiding question for the context they want to change. At the 2017 Australian Conference Richard will be sharing *NEW* NLP tools and techniques to help create and build resilience. Based in New Zealand, Richard Bolstad is a Master Trainer of NLP, Author and Psychotherapist. His central interest is in linking NLP to wider issues of spiritual devleopmet and conflict resolution. In addition to training NLP, Richard teaches Hypnosis, Transforming Communication and Taoist Healing Techniques. Richard is a speaker at the ABNLP 2017 Australian NLP Conference taking place in Sydney, 25-26 February. When a traumatic event occurs, a neural network is set up in the brain with memories of the event (VAKOGAd), instructions about attempted responses (K), a time/place coding (Hippocampus) and an emergency rating (Amygdala). If the emergency rating is low enough, a pattern of Resilience occurs, where the person is distressed by the event but able to keep functioning normally. If the rating is high enough then at least for some time a PTSD-style response will occur and the person will have severe difficulty performing normal daily functions. In the case of a PTSD-style response, most people will gradually edit the neural network over the next couple of months so that it no longer interferes with everyday functioning, a pattern called Recovery. Some people have a pre-existing thinking style which makes recovery difficult (eg a pattern of constantly checking in case something bad is about to happen again) and they will then continue to have problems long term, a pattern called Chronicity. Resilience is pretty much the core successful human response to disaster that NLP seeks to remedially create (in fact NLP goal-setting, reframing and dissociation are used to create resilience). Note that research show that resilience is not a set personality trait so much as a set of actions you can choose to take. From an NLP perspective we can use a variety of techniques to assist a person move through trauma. (10) to take care of one’s mind and body, exercising regularly, paying attention to one’s own needs and feelings and engaging in relaxing activities that one enjoys. Meta Programs and the LAB Profile®: What’s the difference? abnlpevents November 5, 2016 November 10, 2016 Comments Off on Meta Programs and the LAB Profile®: What’s the difference? Since 1998 I have been certifying consultants, trainers, coaches and executives from around the world to use the LAB Profile (Language & Behaviour Profile) in business and other organizations. Highly-skilled people attend this program because they know it will dramatically increase their ability to help clients solve difficult problems as well as create a unique opportunity for their careers. Meta Programs are the same thing as the LAB Profile. I already studied them and know what I need to know. They are just filters and who needs more filters? Nice to know but there are no practical uses for them. What!? I was shocked! And all these years I have been using the LAB Profile along with my NLP skills to create a very lucrative practice helping organizations and people. Some Examples from my consulting business: Assisted a manufacturer to avoid a strike and get the first 5 year contract with their union in the history of the company; Decoded specialized LAB Profile market research to develop successful advertising strategies; Transformed entire call centre representative behaviour to stop the bleeding of customers from an insurance company; Helped negotiators to increase revenue by millions of dollars by changing their behaviours with their customers. Appeared on national television using the LAB Profile to decode election strategies for the general public. In short, my NLP and LAB Profile skills have made my fee irrelevant in the market place. My customers are willing to pay whatever it costs to take advantage of the insights and skills afforded them by these skills. Perhaps the information has not been getting across to NLP-based trainers and consultants, so I would like to correct some misunderstandings. What are the Differences between Meta Programs and the LAB Profile? A specific set of Influencing Language to match each pattern. Rodger had also discovered some practical applications. This was something I could actually use. At the time we included the LAB Profile in a program called “Managing High Performance Teams” and I began to explore what else could be done with it. On top of this several people have used the LAB Profile as a research topic for their Master’s or Ph.D. theses. Several psychological profiling tools have been developed using the LAB Profile to use with individuals and teams. (See Jay Arthur’s NLP Personal Profile, Patrick Merlevede’s IWAM, Arne Maus’ Identity-Compass and Jaap Hollander’s MPA Mind-Sonar) All of this information on what uses trainers, consultants, facilitators and coaches are doing with the LAB Profile is irrelevant if people won’t give it a try for themselves. I wrote the book Words That Change Minds quite a few years ago to describe the Patterns and give information on how to use them for a few practical applications. But that was only the beginning. Since then, we have discovered many more practical applications for consultants and trainers. Imagine being able to understand, and predict people’s behaviour using a rigourous, empirical and scientific method for motivation. The LAB Profile is an exciting alternative to standard problem-solving approaches which our customers have all heard before. Shelle is a sought after trainer in the art of influence & persuasion – specifically what motivates and demotivates people. As a recognized world expert in the Language and Behaviour Profile or ‘LAB Profile’ Shelle trains people to recognise and use 13 distinct meta-programs categories that effect motivation and performance. Shelle is a speaker at the ABNLP 2017 Australian NLP Conference taking place in Sydney, 25-26 February and she is also presenting her LAB Profile Practitioner Training 27-28 February. What is really behind the candidates’ statements in the first US Presidential debate of 2016? While analyses have been made about who won, who fell into the other’s trap etc., I was curious about who was using which Motivation Triggers™ and how effective they were. Were they able to use words that change minds, and if so who’s? Motivation Triggers™ describe what motivates people, how they think, how they make decisions and how they act. They show up, hidden inside the words people use, and in their behaviour. People who have a Toward Motivation Trigger™ need a goal to be motivated. They want to achieve something and focus on where they are heading. When people have an Away From Motivation Trigger™, they easily notice what is wrong or should be prevented and avoided. They are motivated to get away from the things that bother them. People who have an Internal Motivation Trigger™ decide for themselves, based on what is important to them. They tend to reject ideas when told what to do. People who have an External Motivation Trigger™ are motivated when they are appreciated, recognized and get feedback. When making decisions they are influenced by outside people or information. People who have an Options Motivation Trigger™ love having lots of choices and alternatives. They start things and often then start another something else, instead of completing the first activity. People who have a Procedures Motivation Trigger™ prefer to follow a step by step process and often believe there is a “right” way to do things. Without a procedure they may get stuck. When they start something, they are driven to finish it. 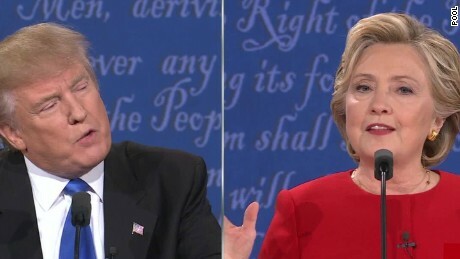 Using the transcript from the first presidential debate in 2016 I ran each candidate’s statements, topic by topic through the Libretta® analysis. the economy, trade deals, government regulations and cutting taxes. He recognizes what the issues are without focusing on solutions or goals to be met. When talking about jobs he uses Toward language mentioning that he wants to “create tremendous jobs”, but this is a relatively rare use of Toward language compared to the number of times he used Away From and Internal language. This indicates that he is much more concerned with problems, things he does not like and the strategies that he does not approve of. The language he uses resonates with people who are angry and upset about unemployment, and economic disparity. They respond well to someone who matches their level of anger and frustration, which Donald Trump clearly does. Hillary Clinton, in her opening statement used more Toward and Internal language, talking about what she wanted to achieve and the goals she thought were important. When criticizing Donald Trump, she used Away From and internal language fairly consistently and, particularly when she attacked his attitudes actions and behaviors. Her main Motivation Trigger™ was Internal – speaking from her point of view about what she thought was important for the country, but not in problem terms (Away From) nor about moving toward goals (Toward). She finished the evening with Toward and Internal language in her closing statement, again speaking to what would be important for her to achieve during her presidency. When Hillary Clinton used Away From language it was mostly directed at Donald Trump, and only rarely directed at issues that need to be solved. For her to attract people who respond well to Away From language, she would need to express more of the outrage at the issues that are faced by Americans who have not yet decided to vote for her and talk about how people are suffering. This is the strategy that Barack Obama used in his “yes we can” speech. With the exception of that tagline the vast majority of his speech was identified to be in away from language. To attract some of the Donald Trump supporters or the undecided voters, Ms. Clinton might consider switching the direction of her language (she can still say the same messages) from Toward to Away From for these particular audiences. Being selective about the language patterns per audience what would help her attract some of those undecided and some of the weaker Donald Trump supporters. The Language and Behavioural (LAB) Profile is the work of Shelle Rose-Charvet based on NLP Meta Programs. The LAB Profile predicts behavior based on one’s use of certain types of language patterns (which reflect the thinking styles of a person and indicates their motivation and attitude). With this information you can predict job performance, you can assign tasks efficiently, and you can influence behavior. Join the Australian Board of NLP at the 2017 Australian NLP Conference with Speaker Shelle Rose Charvet on 25-26 February 2017. Also join Shelle for her LAB Profile Practitioner Certification directly after the conference. NLP Master Trainer Marvin Oka is one of the co-founders of a new discovery in neuro science known as mBraining. Today we would like to share with you a short clip of Marvin talking about a simple aspect of our multiple brains. We are still sourcing our venue and securing the lowest admission fee for our ABNLP members – early enrolment will start on 1 May, open enrolment will begin on 15 May. Thank you for registering your interest for the mBraining for Mindfulness workshop! Because you have registered your interest you will receive a special invitation to register early between 1-15 May for a special tuition price. Only 50 seats will be available!